I’m pretty stoked!!! BlogAid posts are now on Andrea Whitmer’s hand-curated WordPress and Genesis news site, The Daily Bolt. My posts are sitting alongside WPTavern, SkillCrush, Web Savvy Marketing, Carrie Dils, Post Status and more. I’m tickled pink to get to meet live on Thursday with the folks in my DIY SEO course and Level 6 of my Webmaster Training courses. It’s been a while and I’ve got NEWS!! For the SEO folks, I’ll be spilling the beans on expansion of the course, new courses on the way, and what will be in the next SEO Workshop. For Webmasters, I’ll be revealing what’s coming down the pike in SEO that directly impact the theme and sites. This will be big biz for many designers and those ahead of the curve are going to be able to advertise they are up to speed on these important issues. Did you miss any of the hottest tips and breaking news from the past week? We got started with a bang on the new case study tests of all the free comment reply notification plugins!!! Thanks so much to the 20+ folks who signed on to become official testers! Y’all sure came out in force for the first test. We had about 70 comments! It was wonderful to really put the Subscribe to Comments Reloaded plugin through its paces. I’ve got bunches of screenshots and notes and I’m finalizing my report on it now. We’ll be starting another test with a new plugin on today or Wednesday. I did a bunch of pretests on the super old plugins and have decided not to include them in the public tests, but I will be reporting on them because I know a bunch of y’all are still using them. I’ll also be looking into importing your subscribers from an old plugin to a newer one too, because I think once you see the new ones, you’re going to want to switch. These tests will take the whole month of October to run, so look for the reports and review posts to hit around November. I’ve been doing up to 2 HTTPS conversions a day and I’m booked every day with them this week. I’ll also be on boarding the last wave of folks who contacted me in Sept for their conversions. We don’t know when the new Chrome version will roll out with the non-secure warning, so hoping to help everyone get there prior to its release. I’m still taking new requests. Folks are contacting me every day for site services of all kinds. ‘Tis the season for site audits and getting security and performance all squared away. Plus, several folks have contacted me for helping with theme revamps. They want to switch to Genesis and I’m thrilled to hear that!!!! The plugin has been pulled from the free WordPress plugin repository. Mike Challis, the plugin’s original developer, reports that he sold the plugin in June 2017 and that the new owners attempted to put malicious code in it. It didn’t take long before it was pulled from the plugin repo. The comments on the post I have linked for you is full of comments stating that it will not return to the repo, where a clean version of the plugin can be found, and ways to switch over to another form plugin. For the past 3-4 years we’ve seen multiple popular free plugins get sold from the original developer and then go evil. To my recollection, Shareaholic was one of the first to do this. Now we have dev companies that specialize in buying up unsupported plugins, or directly from the original dev who is burnt out on free support. Too many of them are going evil by slipping in malicious code. There really needs to be a better way to inform plugin users that the plugin is changing hands so we can watch out for things like this. Yoast made a big post about selling his Google Analytics plugin to the MonsterInsight folks. Wishing the plugin devs had a better way to let us know, since most of them don’t blog and even if they did, most of us don’t follow them. Do you know of a place to watch for plugin changeover news like that? Please leave a comment here or anywhere you see this post online. Regular Expressions are also known as regex code. It can be a frightening blob of gobblity goop, even for the most experienced devs and coders. But, regex is essential for complex redirects, like when you change your permalink structure, or to force every visitor coming to your site from any link to use the HTTPS port. I’ve wanted to learn more about them for years, but there haven’t been that many good resources for beginners. Well, there is now. Go check out this post from Carl Alexander that will help you get a grip on all those unwieldy symbols and what they do. During site audits I often see high hits on admin-ajax. So I ask the client if they routinely get up and leave their computer while logged into their site with the text editor open to a post they were creating. That’s like leaving the taxi meter running while you’re in the restaurant eating. While that text editor is open it is auto saving at a very fast frequency. That frequency is set by a thing called the heartbeat clock and it was turned up to high in an earlier version of WordPress. On top of that, every revision that is saved is piling up in database, creating a ton of clutter in it, which slows it down. There are plugins to control both of these things, but I advise hard coding those directives into the configuration file for WordPress. One of the reasons why is because the Revision Control plugin is no longer being maintained. And those heartbeat plugins are pretty old too. Plus, every plugin you have is a potential security hole on your site, especially when they get outdated and are unsupported. This is something I fix for my site audit clients. Takes all of 20 seconds to do and they can get rid of more plugins on their site. and adding to the potential security holes on your site. Webmasters, the folks over at Kinsta have a nice guide on diagnosing high Admin Ajax hits if you need it. But always ask the client about their habits first, as they are the primary cause of high hits. There are no “top 3 ranking factors” according to John Mueller at Google. The algorithm used to deliver the top search results are based entirely on the query and the search history of the person inputting it. Keywords and backlinks are generally considered top ranking factors. But in this post on Search Engine Journal, it’s clear that the search results shown to a person depend on variety of factors that aren’t the same every time. The moral of the story is – create stellar content that addresses a specific topic and/or answers a question. The latest release of the Yoast SEO plugin introduces a couple of new features. You’re probably familiar with User roles in WordPress like Admin, Subscriber, Contributor, and Editor. Each of them has different levels of access and capabilities on the site. Now Yoast has introduced similar roles to SEO tasks. The two new roles in version 5.5 are SEO Editor and SEO Manager. If you have more than one person creating content on your site you’ll want to read more about them. Yoast also overhauled the dashboard widget in this version too. This widget appears on the main WP dashboard. At a glance you can see how many posts have green, yellow, or red dots. And you can see links to the latest posts on the Yoast blog too. The redirects manager has a new filter to help you find things like the posts you marked as 410 for Google to deindex. Lead generation – every successful site has a system. Doesn’t matter if you run ads on your site or sell a product or classes. If you want to make money, you need a plan to get more eyeballs on your site. And once there, direct them toward what makes you that money. For those of us in the service or product based side of things, it’s also important to create a funnel. We need something that steps folks into our offerings and eventually leads to higher priced ones. Visibility expert Denise Wakeman has a stellar post on lead generation that takes you through 5 easy steps to grow your prospect list. It’s so stellar that even if you don’t work on the service/product side of things, you still want to read it. This guide will help you identify your site’s goals and target audience too. CloudFlare Stream is a new product from the CDN that intends to compete directly with Vimeo and YouTube for being THE place to host your livestream events. They’ve combined encoding, global delivery, and player into one package. Their primary goal is to “expand the number of companies that are streaming video from 1,000 to 100,000” by making it dead simple to use. For you and me, that means seeing more video than ever from both big, medium, and small producers. Do 2-Second Videos Work on Facebook? Video, especially in ads, is not just for the big companies either. If you have any doubt about just how much money there is to be made in the video marketing business, or how popular it is already, or that it’s becoming the #1 way folks want to consume info and entertainment, just read this post. Mari Smith, the queen of Facebook and paid spokesperson for multiple video app developers and platforms, reported on this post from Ad Age about the impact of just 2 seconds of video consumed in the Facebook stream. According to a new study by Oracle Data Cloud and Facebook, videos ads that have views under 2 seconds increased sales by a whopping 52 percent. 2 seconds of video = 52% increase in sales. The other takeaway for those of us who do livestreaming on Facebook is to have some sort of wow factor in the first 2 seconds that grabs folks and makes them click to watch more of the video. I’m rethinking my custom image and my intro. Thanks to Barb Tomlin for the heads up on this report. The folks at Primary Image have released a new report on the raw bloat and slow speeds of popular free page builders. Of the worst offenders, you’re also giving up good SEO in the form of schema markup too. On the freelance hiring sites, I frequently see job postings for folks who’ve spent 80-100 hours working on their themes only to end up hiring a designer to finish the project. And what a hot mess those projects are too. There aren’t many designers who want to go in behind a novice on something like this. Of the least offenders, I’m told by my webmaster designer peeps that Beaver Builder for Genesis is a thing of beauty. If you have to use one of these things, use that combo. What else I will say is that zero, nada, none of my money making clients waste a single second building their own themes. I hire a pro to ensure I meet all SEO and UX and UI coding standards, many of which are now rising SEO ranking factors with Google. Building your own theme is an amateur’s dream, in my opinion. I totally get wanting to save money and all. But do weigh in the fact that you’re likely losing money from poor design that you don’t even know you have. This is the same reason I pay a CPA to do my taxes. She keeps up with all of the changing laws and deductions and such. She actually saves me more than she costs. The real way to save money on a designer is to first get educated so you can enter the design process with real theme specs, content, and conversion goals in hand. My designers love me because the folks I send them already have all of that and have already played with Genesis themes and know how they work and the structure they want to start with. Most all the rest of it is cheap paint at that point. So, give that a thought when you’re looking to change themes and bring your site up to speed with today’s standards. 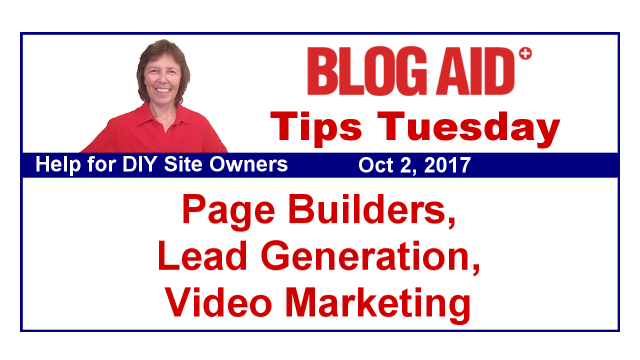 Thanks for the shout-out to my lead gen article! It’s such an important part of any business’s business success. The steps are simple, but you’ve got to do the work! Also, love that info about 2 second video ad. Wow! Always happy to share the good stuff, Denise!! Yeah, I’m definitely rethinking the first 2 seconds of my videos!! There are so many free ways to create a video, including software that comes with your computer’s OS, I think everyone can find a way to break into video at some level.